Some famous ladies who do love leggings, include Rhianna, Scarlett, Mischa and Jessica. As you can see, Lindsay, loves them and is apparently quoted as saying they form part of her favourite outfit!! 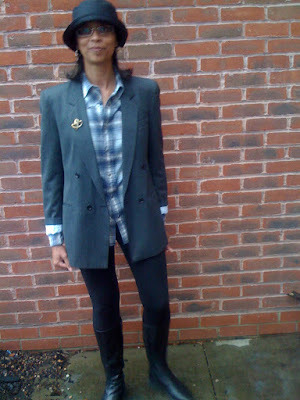 or with a blazer and checked shirt for a casual, relaxing look!! I know many of you love them and many of you hate them-I'd love to hear all opinions-haha!! Have a wonderful weekend, ladies!! Doesn't it make you laugh that people said leggings would "never" come back? Never say never! You look really beautiful with these clothes!!! Hi Wendy-this is so like the comment from Secretista yesterday, who said 'shoulder pads will never came back' and I replied by saying 'never say never'-haha!! Hi zepequena-thanks for your lovely comment and for stopping by my blog too!! leggings are pretty much essential for a british summer! however, today i saw someone wearing white ones, which was NOT a sight i wish to see again!! I just don't like it when people wear leggings as pants? But well, I think they are awesome for really short dresses that make us feel naked if we wear them alone! I love the stripes in the first outfit & the second outfit blew me away! So well put together!! Hi elle-glad you agree and I would most certainly not wear white leggings either!! I looove them! And I know they are overdone and over-worn, but aren't they just so comfy? And they still look chic even though I can sit cross-legged in them on the floor- that is a rare combinations. I say it's a go! Love your outfits! Especially the one with the blazer! Hi yiqin-thanks so much for your lovely comment!! Hi emma-thanks so much, I do agree with you and yiqin that you need a slightly longer length top or skirt or dress to make them work. Hi asiancajuns-thanks so much and I totally agree-they're ever so comfy and stylish too! I usually, love leggings in the winter..especially, in the midwest with boots and all..but I've been wearing them this summer..the sheer kind..really a summer feel with my dresses. For one thing, I don't tan and I hate to shave my legs..so I've been wearing them with some short dresses..sort of a dodostyle..I guess. I love dodostyle.com. Hi ash1314-yes these lame/leather styles are fabulous-I need to be a bit more daring for these! god, i love the questions that you ask. they're so relevant yet the stuff that is never dealt with implictly because they somehow seem so matter-of-factly. i love leggings only if they suit the outfit. personally, i think that not all can pull them off, and i'm always wary of the times i'm unable to. .
Hi ellie-yes, they are such an easy option to wear!! Thanks and you're welcome too! Hi fashion dreamer! i'll have to check out sass & bides line-thanks! Hi p-thanks so much, I appreciate that comment, so kind! i need a blazer like yours, must thrift men's jackets! dreamer, you mean the one's from fall collection?? i covet those leggings. Less than a year ago... I kept all my leggings (of different colors and lengths)in a different storage area and swore to myself NEVER to wear them in the near future again. Though even before I had my baby, I would wear leggings with long tops, skirts and what have you...but after wearing them for almost 9 whole months (oh they were the comfiest things a preggy girl could ever wear! ), I still feel a bit "heavy" like I'm preggers everytime I see them, or at least contemplate on wearing them from time to time. I guess that's the only thing that stops me from wearing them again... they surely are CUTE and hard to let go of! LOVE them if they're done right... they look grat on you! Thin is best for leggings... just my opinion! I really like your second outfit. It took me a really long time to come around to wearing them, but sometimes they are just so easy to throw on. I really love leggings! I hate to see them starting to fade out! Oh I love leggings! The 2nd outfit is fantastic!! Oh, I really like the second leggings outfit. The blzer adds such coolness. I'll never give up leggings, I love them so much though lately I've tried to mix up my wadrobe more. I love your second outfit, it's so creative and your boots are cute. I want ones just like that for next winter! I never thought that leggins come back again but I wear leggins and I love it! It looks good!! i love leggings on other people but hate them on me! apparently linsay is bringing out her own line of leggings (that's how much she loves them!). Frankly speaking, I love leggings ))) so comfortable. I´ve a pair of leggings in my wardrove... I´m going to put them on! 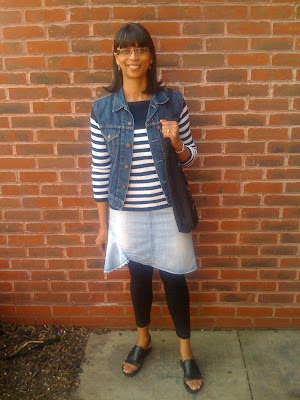 Hi fashion herald-thanks for stopping by my blog and for your lovely comment too! Hi the world is my catwalk-yes, this was my pregnant uniform too, but I've had nearly ten years break, so I can wear them and they feel like a new style again-haha! !Have a good weekend too! Hi i think thats hautte-yes, I personally wouldn't wear her middle outfit!! Hi fifi flowers-so kind, thanks a lot!! Hi sally jane-thanks and I agree, they are an an easy stylish option for an outfit!! Hi anjeanette-yes, totally agree on that one-thanks! Hi saray-glad you agree and thanks!! Hi nic-thanks so much, very kind!! Hi nay'chelle-that's lovely thank you!! Hi jen-thanks so much and I hope you find the boots you're after too!! Hi bi-style-so glad you agree!! Hi angelgrotton-yes, totally agree with you-thanks so much! Hi zepequena-thats cool to hear you will wear yours too! I love them - you can combine them in so many different ways! I have one pair, I really haven't worn them at all. I shall have to wear them and post an outfit for you soon! What I do love though, is your plaid shirt!! Hi nadine-thanks so much and yes, they're very versatile!! Hi pamcasso-I'd love to see a leggings outfit!! My shirt is actually a mens topshop one, thrifted from the boot sale-thanks!! I still love them, but not in pale gray; so hard to wear! Hi couturecarrie-I really only like black leggings!! Hi apricot-thanks for sharing your preference!! Trend or not I love leggings, and I love your last look - that blazer is so gorgeous! Hi always in style-thanks so much, I agree, trend or not, leggings rock!! Hi madamedior-thanks a lot for your lovely comment-I can't do without my leggings either! I like the last outfit, so cute with the hat! Hi qifa-oh, I'm not that brave-haha!! that blazer is SO hot! Hi fashion is poison-thanks so much! !